The Chennai Global Azure bootcamp 2016 happened on Apr, 16th 2016 went on really well with lots of technical session and handson labs. We received more than 1000 registrations from people with variety of background, some of them were practicing professionals, few from IT Pro background and lots of students who are aspiring to be a cloud professionals soon. We received 10 fantastic speakers from Chennai and Bangalore who delivered various tracks on various topics including Azure Apps Service, Open Source, Big data. I delivered a topic on Azure Data lake Analytics and Data lake store, the services which are currently in preview, but the attendees were able to recognize the value of the services and how it can help developers to leverage these big data analytics services and exploit big data. 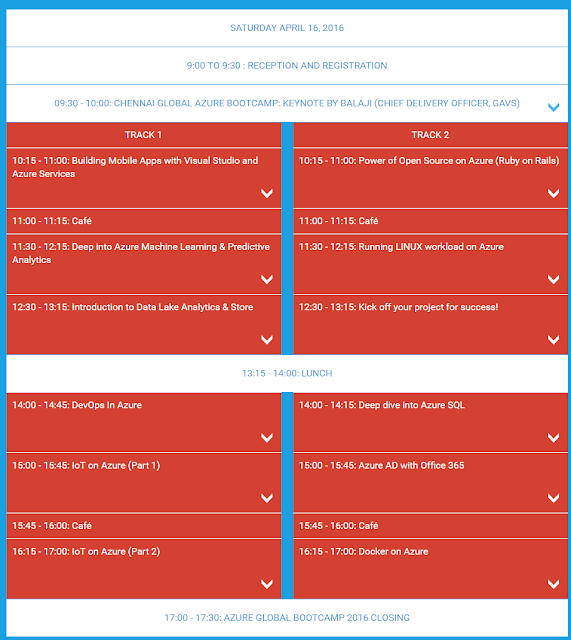 12:30 - 13:15: 14:00 - 14:45: DevOps In Azure 12:30 - 13:15: Kick off your project for success! GAVS Technologies and 8KMiles Software Services are the key local sponsors who helped us to execute such a larger event in Chennai. 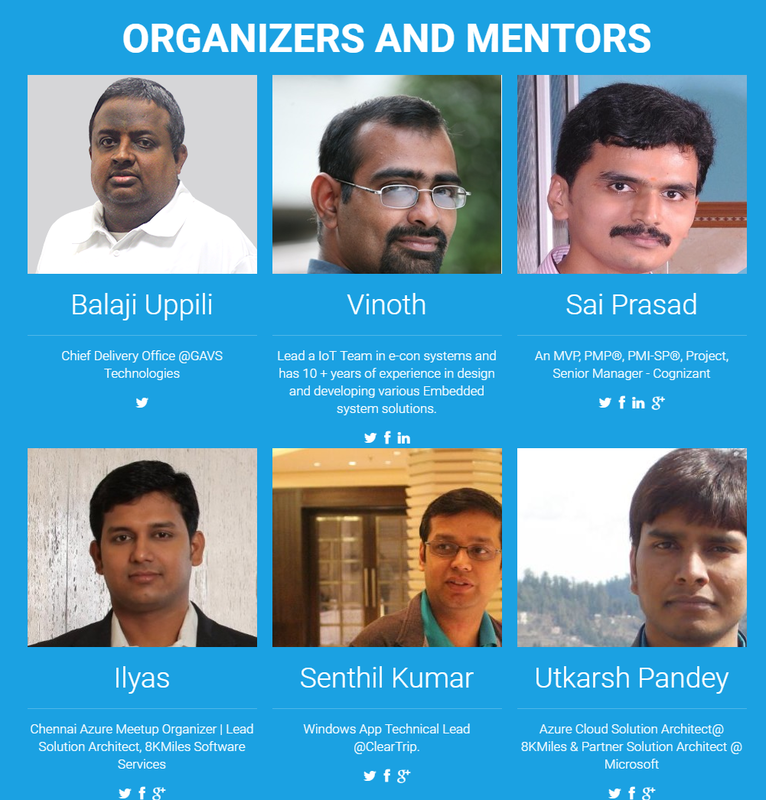 Infact, this is one of the largest community driven Azure event in the recent past conducted in the city. I'm very thankful for all the sponsors in helping us to execute the event. Overall, the event went on really well, and a lot of great content was delivered by our awesome experts and MVP speakers. Thanks to all the presenters as well as all attendees! Without you, there wouldn’t have been an event. Also, special thanks goes to the Global Azure Bootcamp team for organizing the global event and getting together the prizes from all the global sponsors. I had a great time presenting and helping people out with the hands-on labs launching Windows and Linux VMs towards the end of the day. It was a great learning and fun experience. 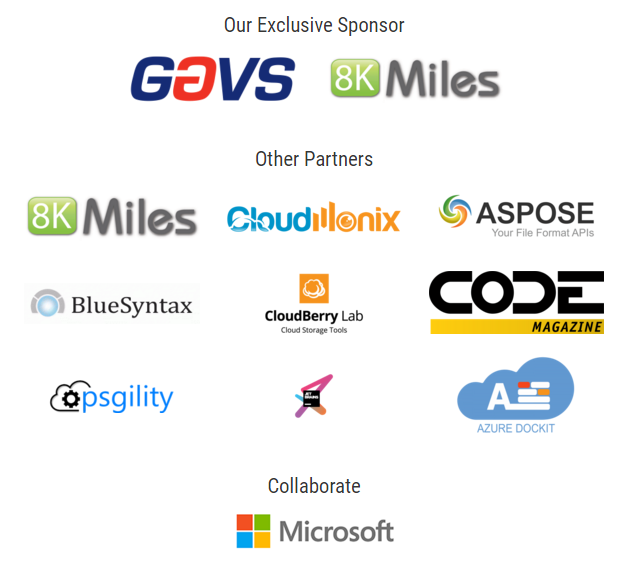 Currently, I’m planning to help coordinate the Chennai Global Azure Bootcamp event next year as long as god will. Until next year, adios amigos! P.S. Please feel free to contact me with any question about Azure or general feedback on the event. You can either submit them to me in the comments on this post, via Twitter @ilyas_tweets or drop an email to me @ ilyas@bornoncloud.com. Just like SQL we can sort rowsets by using the ORDER BY operator in U-SQL by specifying the ASC and DESC keyword controls whether the sort is ascending or descending, respectively. In the below U-SQL SELECT * FROM statement you can order the output rows IF and ONLY you also specify how many rows you want to fetch back, failing to using FETCH First clause will result in error. The reason for this behavior is, when running U-SQL scripts in the Azure Datalake analytics distributed environment, performing any sorting will be a very expensive operation. It is for this reason that the ability to order rows has been deliberately restricted to the cases shown above. Alternatively, you can also specify ordering when using an OUTPUT statement which does not require a FETCH FIRST. Declaring re-usable parameters is always handy when writing a lengthy U-SQL Scripts. U-SQL also supports using DECLARE statement while writing queries. You can use the DECLARE instruction to save values of Native U-SQL datatypes. You can use other variable declarations in a #DECLARE statement to combine strings. The above statements are not explicitly supported by U-SQL, however an alternative is to get a single-row rowset with a single column and then JOIN that tiny rowset other rowset to get what you need. We’ve seen this example EXTRACT Operator to extract data from a single file, but what if we want to extract data from multiple identical/un-identical data from similar or from different locations. The below example shows how to read data from multiple files from different locations. Pivot operator in SQL helps us to turn the unique values of a specified column from a single/multiple rows into multiple column values in the output. Additionally we can also perform aggregations, wherever required, for column values that are necessary in the final output. If you want similar functionality in your U-SQL query, you have to use the CROSS APPLY operator of U-SQL to essentially do the similar job. Similarly if we want to convert a set of columns into rows or revert back to the previous state (refer the above situation), we have to use ARRAY_AGG operator. In the example below you will see rowset taken apart by CROSS APPLY and then reconstructed via the ARRAY_AGG operator. Now lest look at the common use of HAVING operator. We can use HAVING to restrict the output rowset to those rows that have aggregate values we are interested in. For example, we want to find all the Regions where total dwell time is above some value. // Count the number of total sessions. Count the number of total sessions by Region and include total duration for that language. DISTINCT also works for user-defined aggregates. The role of C# code behind class file is very similar to having C# code behind in asp.net web forms application. 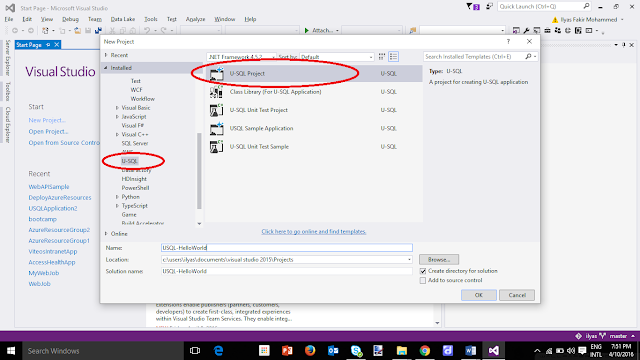 The purpose of the code behind file in a USQL project is to store C# code that can be used in your U-SQL script. 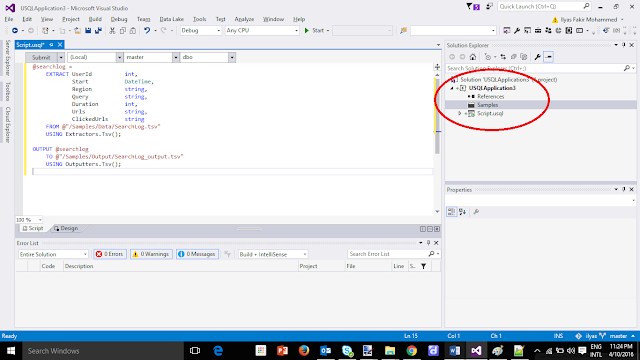 Every U-SQL Script in Visual Studio will have a Code-Behind file associated with it. In the case of the Script.usql file w’ve created so far, the code behind looks like this. Clicking on the code behind file will show the following code. To use the helper method in the script, follow the below code snippet. Please note that we have to use the fully qualified name while referring the function in the script, failing to do that will cause run time error. In certain scenarios, we may need to create a new column as part of the data transformation. The below sample shows how we can add a new column into the rowsets. The below snippet shows the application of "DISTINCT" to fetch only unique values. We can use use ROW_NUMBER windowing function aggregate to assign row numbers to the dataset. In Build 2015, Microsoft announced Azure Data Lake analytics, Data lake Store, Data Factory, Data Catalog to address analytics and big data challenges of enterprises. 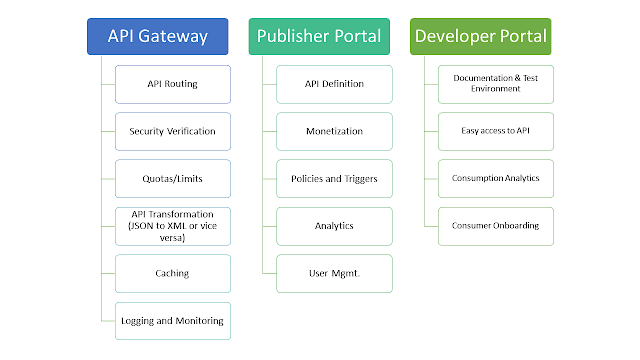 Many wondering why is “Yet another big data service” when there are plenty of big data technologies and products in the market including open source and premium products. Microsoft also has HDInsight in their market place which is an Apache Hadoop distribution powered by the cloud powered by HortonWorks. The primary reason being the complexity and learning curve involved in learning and getting started with the existing big data tools and technologies. Below is a partial and most popular list of Apache open source technologies (For complete list of apache big data open source projects, click here) which addresses certain challenges of a greater big data problems, but there are plenty of industry specific vertical and domain based big data solutions from various vendors. At first sight, this is of course confusing especially if you are coming from a Microsoft world, you will simply skip and drop the big data project. The second major reason is currently Microsoft doesn’t have any Big data solutions to cater their enterprises audience, being a provider of massively successful SQL Server solutions Microsoft doesn’t want to left behind on Big data offering and this makes lot of sense as well. Finally Microsoft doesn’t want their Visual Studio, .Net/C#/SQL developers to look at another vendor or learn new technologies to achieve big data projects. 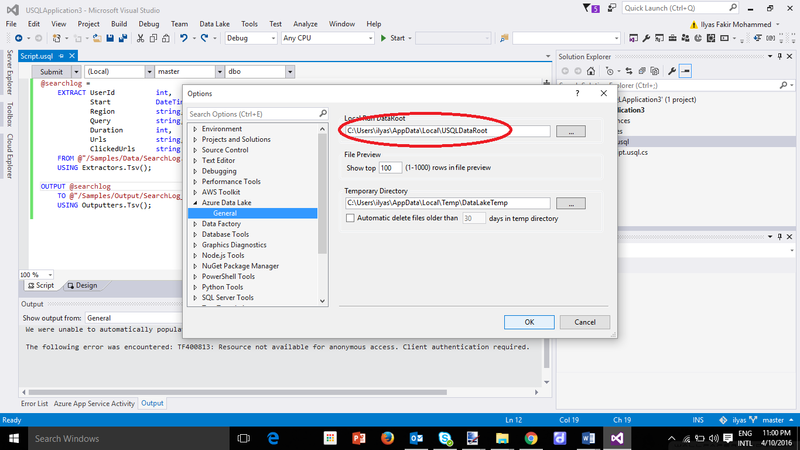 Azure Big data lake suite is the answer for bridging the gap between .Net worlds with big data. However the real challenge for Microsoft was deciding between building a big data product from scratch or use existing established open source projects. Finally, Microsoft took the later route i.e. 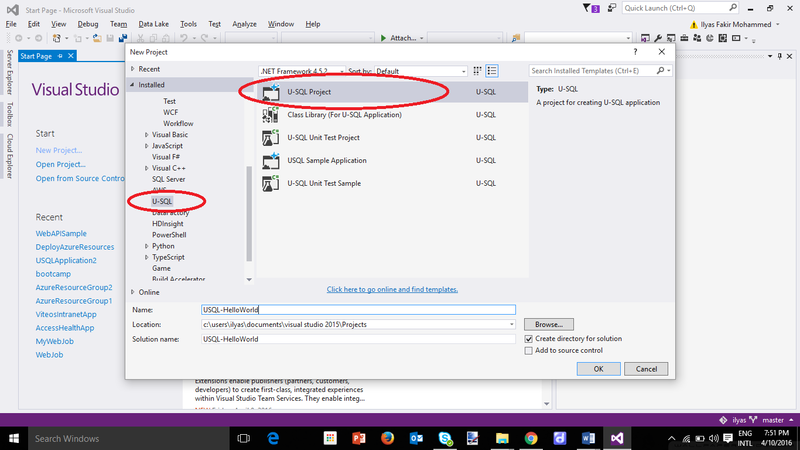 embracing open source projects to power Azure Big data suite. The Data Lake analytics service is a new distributed analytics service built on Apache YARN that dynamically scales so you can focus on your business goals, not on distributed infrastructure like other IaaS based solutions. 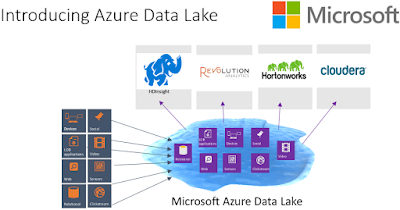 Azure Data Lake analytics natively works with all the data sources including Azure SQL, SQL Server on VM, Azure BLOBs, Azure SQL Datawarehouse that lives in cloud as well as from elsewhere, similarly Data lake store built in top of WebHDFS can ingest and receive data from any HDFS endpoints whether it’s coming from Azure or anywhere else. 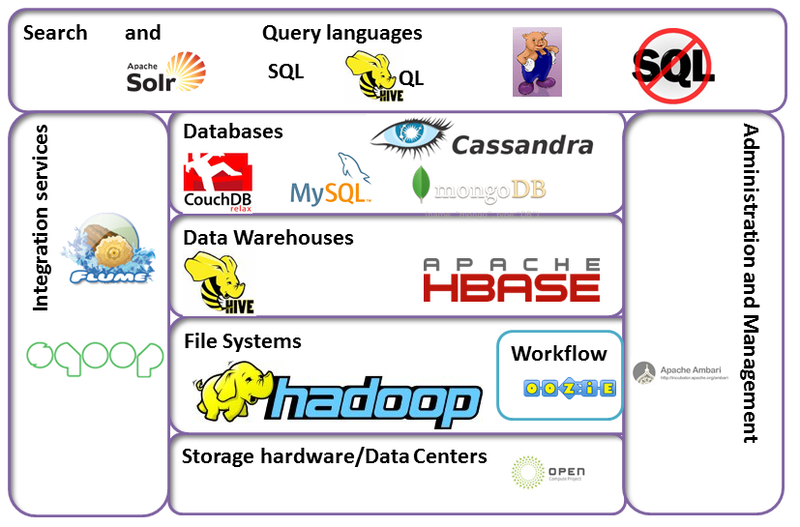 Is the Azure Data Lake Query engine powered by Hadoop? 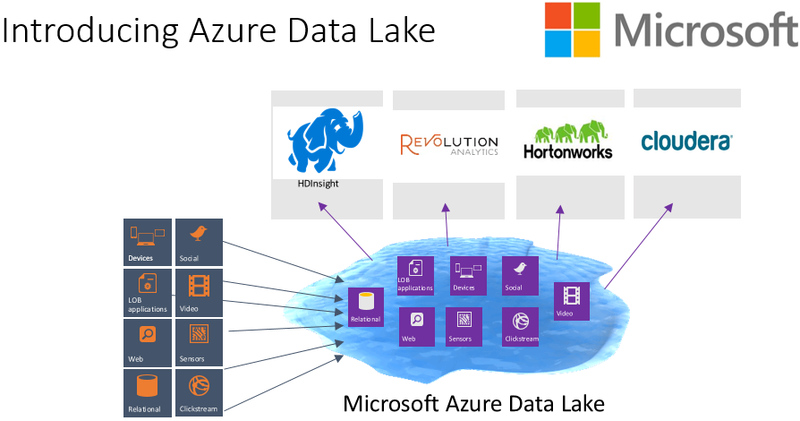 No, Microsoft didn’t build the data lake suite on top of Hadoop map reduce, partly because of the overhead involved in integrating it with the vast set of existing Microsoft products. Secondly Microsoft wanted its developers to use the same SQL + C# even for big data projects and not to burden them with introducing another language exclusively for big data. However, both C# and SQL scores well in its own areas and had advantages and disadvantages when it comes to big data processing, so Microsoft intelligently combined the power of C# expressions and the elegance of SQL and formulated Unified SQL (U-SQL), an all-new big data query language for big data processing. 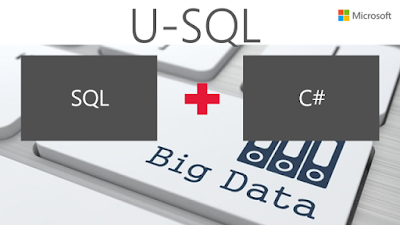 U-SQL, is the big data query language from Microsoft for its Data lake suite. If you are SQL developer and SQL DBA, you’ll notice that U-SQL queries look a lot of SQL queries. Many fundamental concepts and syntactic expressions will be very familiar to those with a background in SQL. However U-SQL is a unique language and some of the expectations you might have from the SQL world do not carry over into U-SQL. 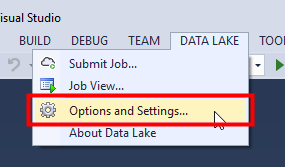 For example, Select in SQL is not case sensitive, but it has to be SELECT (in upper) when used in Data lake. In the upcoming blog posts, I’ll dig deep into the various U-SQL concepts with example. 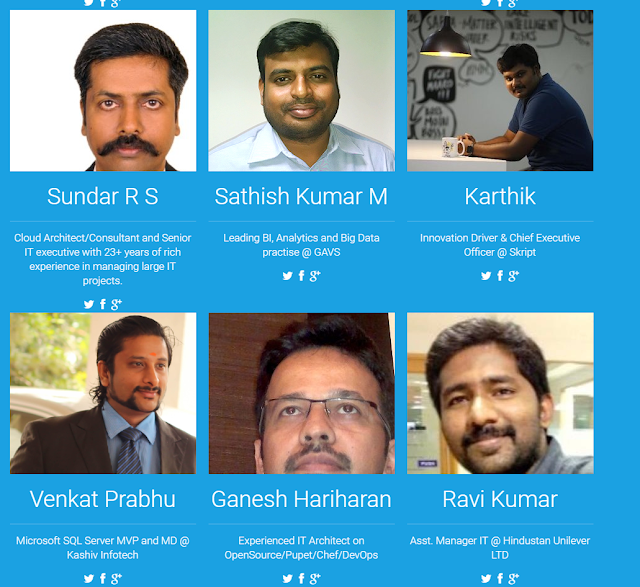 Please come back for more on Azure Big Data Analytics and U-SQL. In the last post, we looked at the detailed step by step process in getting started with the U-SQL Hello world project. Now that we are comfortable in the basic querying and rowset creation process, lets look how we can selectively filter the dataset by applying conditions. The SELECT clause, as in SQL, allows you to pick the columns of interest. Now let’s apply WHERE and HAVING Clauses to further filter @Output rowset as we do in SQL. Logical operators such as AND and OR are supported. Note: Notice the use of "==" in the example above instead of "=". This is because expressions in the SELECT statement are C# expressions. A rowset can be created from itself – this allows you to refine a rowset one statement at a time which may be useful for debugging or simply to make your script easier to use. 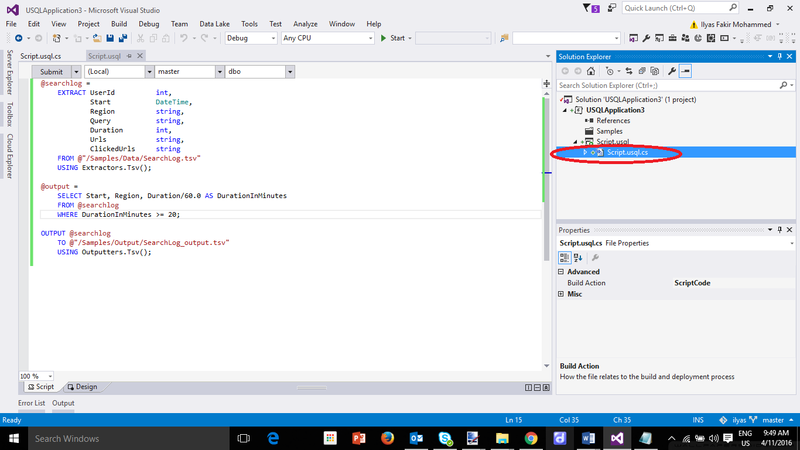 In addition to AND/OR/NOT, U-SQL also supports C#-style logical operators. These are equivalent to their AND/OR/NOT. However, || and && perform short-circuiting which AND/OR do not. The sample datasets are available in the Azure Data lake analytics account for us to get started with ADL. To get the sample datasets, click on Explore Sample Jobs and click on copy samples, this process will copy the entire dataset samples to our ADL store account. Additionally you can also download the sample datasets and keep it in your local environment. Now that we have the data, let’s go ahead and execute the below sample script. This script is a very basic query and it essentially just copies the contents of one TSV file into another TSV file. Click on start button, this will compile the script and run it against the Azure ADL account. After successful completion of the execution, the output file will be created in the output folder inside the samples folder in the Azure Data Analytics Store. You must have noticed that there is no SELECT statement in the first U-SQL, it’s because the input data has no pre-defined schema and hence EXTRACT statement is used to read data from files. However once the data is extracted and created as a Rowset (Schematized), we can apply SELECT on top of it. While using EXTRACT you must specify both the column name and column type. To perform the EXTRACT function, we must use an Extractor – it’s an inbuilt function of Azure ADL that knows how to parse the file and produce rowsets. U-SQL comes with several such built-in extractors for reading data from files. The one used in this script is Extractors.Tsv. (“TSV” stands for tab-separated value). The rows derived from the EXTRACT statement are defined by a RowSet named @searchlog. Rowsets – is essentially an intermediate table structure created by U-SQL to internally pass data during script execution. The rowsets could be further transformed to one or more rowsets. The @searchlog RowSet is written to an externa output file using the OUTPUT statement. A built-in Outputter called Outputters.Tsv is available to write a file in TSV format, similarly we also have Outputters.Csv for outputting the data into CSV format. The ADL query can be executed locally or in the Azure ADL Account. The input data and output data can be placed locally as well as in the Azure ADL account, but while you execute the query locally it may not store (Known bug) the output in the defined location and instead it will store in the below path. Note: To check the exact path, follow the below screenshots. Likewise, stick the "/" separator as it works both locally and for remote execution unlike "\" which only works on local execution. U-SQL is very case sensitive, for e.g. writing extract instead of EXTRACT will cause a compilation error, so make sure to use EXTRACT, FROM, and USING in upper case. Azure ADL doesn’t understand the first row that contains column headers, so make sure the input data doesn’t contain any header column. Similarly the output data produced by ADL will also not contain any column header. However, this feature is expected to be added while the ADL and store generally available.